While dabbling in all this animal welfare stuff, I’ve also been refining the use of stem cells to repair damaged heart tissue. Glad to see my work here has not gone unnoticed. Social transfer of flavour preferences: stereotypers are less convincing? Here are Laura‘s final results. ‘Demonstrator’ mice varying in how stereotypic they were, were fed food flavoured with shatavari powder (which I finally looked up: it’s a form of asparagus which has “rejuvenating effects upon female reproductive organs“; hmmm, may have to ask Laura for her leftovers). They were then each mingled in an empty cage with a naive ‘observer’ mouse who had never eaten this food. After this, each observer was offered a choice between two novel foods: one flavoured with the strange asparagus, one with marjoram as a control. Would they all eat more of the shatavari-flavoured food, or would this depend on how behaviourally normal their demonstrators had been? 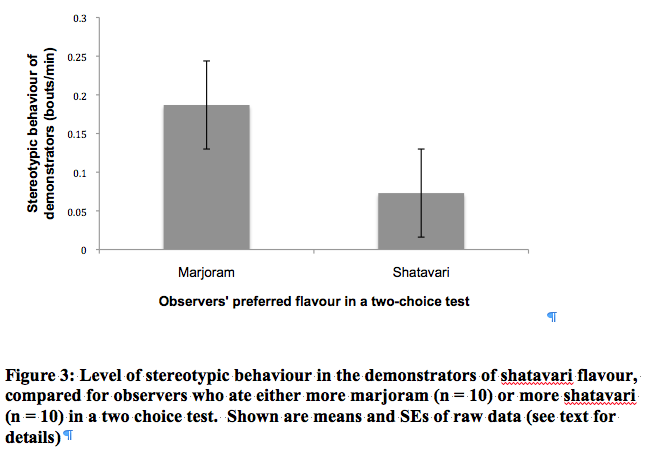 Just as predicted if stereotypic mice are socially impaired, the observers who went for the marjoram tended to have had more stereotypic demonstrators than observers who ate more of the shatavari. OK, it’s not perfect, but not bad either (especially given that in the home cages, we also found that stereotypic mice attract more aggression). 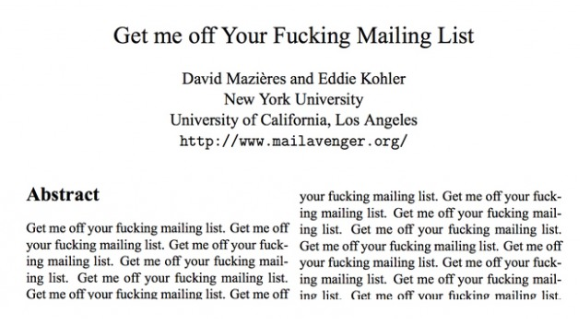 Definitely worth replicating. Comments : Comments Off on Social transfer of flavour preferences: stereotypers are less convincing? Amongst Andrea ‘s 32 chosen mink were 17 that Maria reliably saw stereotyping, but now that Andrea’s down there in Lansing renting a car and a room, all these mink have stopped and are doing nothing at all. She’s spent the time setting up cameras, but after that it’s twiddle her thumbs or come home to Guelph for a while. Mink are often very quiet after being recaged, but I didn’t anticipate this quiet for a full week. 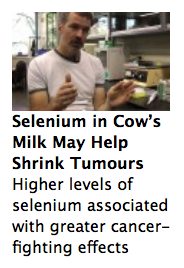 My colleague John Cant is also featured on the UoG website this week, with a quite hilarious photo. 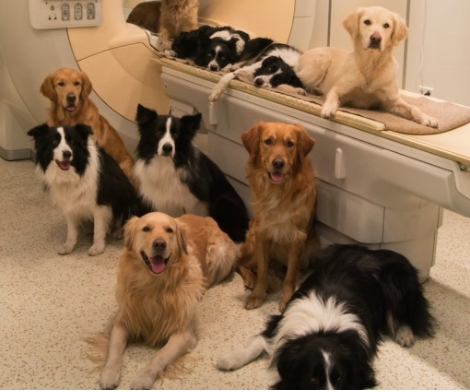 It’s all about dogs this week, with claims that “brain scans reveal how your dog really feels” (sorry folks, pretty sure love is not located in the caudate), and a new survey launched by the University of Bern on dog personality (How much does your dog love sticks? Just how great does your dog think you are? etc. ); click here if you’d like to be involved. This scenario caused me, Laura and Mike some stress today, and possibly knocked some days off the ends of our lives. Luckily all was resolved (the correct tests involved sequential sums of squares, but obviously that’s not the default). This is for a manuscript focusing on the social interactions of mice with different levels of stereotypic behaviour, both in their home cages and during social learning tasks (which worked, amazingly, but more on that when I have a nice figure to post …). Love this so much. Thank you Hanno!! !